Crocker-Amazon is a neighborhood in San Francisco that borders the Excelsior District. Crocker-Amazon covers the area south of Mission Street and Geneva Avenue, extending toward suburban Daly City. The neighborhood is adjacent to Crocker-Amazon Park, named after the Charles Crocker land holdings that once made up the area, and Amazon Street in the Excelsior. The winding streets of the neighborhood straddle the border between San Francisco and Daly City and largely blend in with the adjacent Daly City neighborhoods of Crocker and Southern Hills. Crocker-Amazon neighborhood is slightly more affluent than the Excelsior, but retains much of the same racial diversity, including a large Filipino community. The majority of the neighborhood consists of single-family homes. Crocker-Amazon Park borders the neighborhood to the north. It has four playgrounds and recently renovated and lighted soccer and baseball fields. 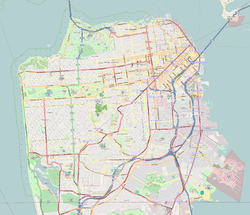 Adjacent to the east of Crocker-Amazon park is McLaren Park, San Francisco's second largest park after Golden Gate. It has a golf course, two lakes, jogging and hiking trails, a public pool, an old reservoir that is used as a dog swimming area, and the Jerry Garcia Amphitheater which houses concerts and festivals. The neighborhood benefits from some of the most varied weather in the city, with a balance of sun and fog. The top of the neighborhood boasts outstanding views of downtown San Francisco in the gap between McLaren Park and Twin Peaks. Parts of the neighborhood, particularly heading toward Southern Hills, feature free-standing single-family homes with at least 10 feet on either side (in many San Francisco neighborhoods, there is a gap of no more than a few inches between homes). The diverse architecture of the homes throughout the neighborhood include Marina, Arts & Crafts, Victorian, Edwardian, and Mid-Century Modern styles. This page was last edited on 23 February 2019, at 05:57 (UTC).